What does Sombai Cambodian Liqueur mean? Sombai – pronounced as “som bai” – means “some rice, please” in Khmer. Rice is the main staple food in Cambodia, but is also the base of the distillation of alcohol hence the preparation of the staple alcoholic beverage, the rice wine that the Cambodians drink. Throughout history, the Khmer have used local liquor in traditional medicine to extract the benefits of fruits, spices and roots. It is now considered by some as the national drink of Cambodia. Because we wanted to make a delicious liqueur, sweet and fruity, we decided to add the secrets from Mauritius that are used in the production of infused rums that we drink in the islands. 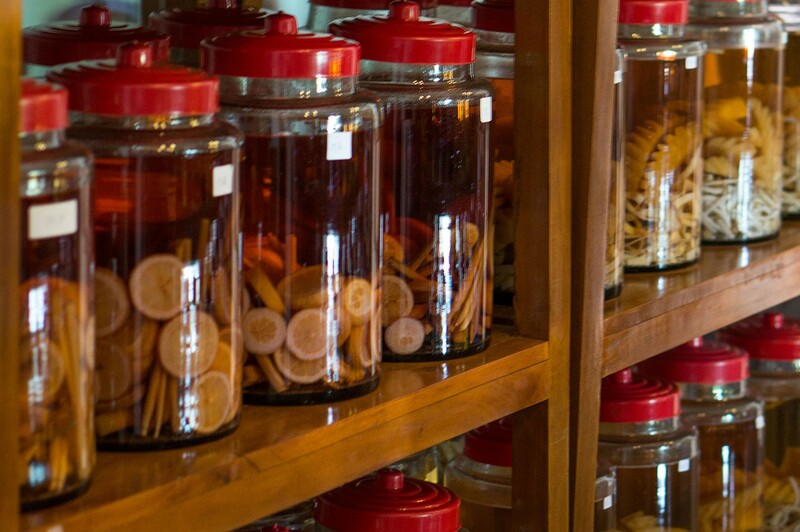 Thus, the spices and local fruits freshly bought from the market are infused in the spirit. The flavours are always presented in a combination of 2. Indeed, this enhance the balance and complexity in taste for this Cambodian liqueur. Furthermore we insert a sugar cane stick in each bottle rounding out the taste and giving it an additional woody flavour as time goes by. Already very tasty at the time we proceed with the bottling, it all gets even better with time. Some may say “no matter the bottle, provided there is tipsiness”. To agree to this implies ignoring the quality of young Cambodian artists and their ability to sublimate the bottles. And “to crown” the whole thing, each Sombai bottle proudly bears its traditional colourful krama cloth over the bottle top. Moreover, young artists paint on the Sombai bottles and they are decorated by hand, making each of them a unique piece and an amazing souvenir. For more details you can read the reviews posted on Tripadvisor regarding the Sombai Workshop. I am in Siem Reap for a couple of months, and I am interested in exporting your wine to Colombia (south america), are you interested too? Please let me know in order to have a meeting. We would be delighted to discuss about this subject with you. When is it the most convenient for you, in the week or on the weekend? Good Morning, a friend of mine has just returned from Siem Reap and brought with him a sample of the infused rice wine in the hand painted bottles. I have a hotel in Adelaide Australia and I was wondering how we could go about selling the rice wine in our hotel. I would love to hear from you. I am interested in meeting you in Cambodia in Nov. I will fly in on the 5th for a couple of days and then head off to Vietnam. Please contact me via my email to arrange an appointment. Our workshop & shop are open daily from 9am to 5pm. Location is 176 Sombai Road. Can I buy a few bottles and have them shipped? Under retail sales, we can only ship inside Cambodia. Unfortunately the shipping company here (even DHL) don’t accept to transport alcohol overseas. I fear, you will have to visit this loving country of Cambodia to enjoy some bottles of Sombai, until we can find an importer in the US. Hello I was just reading the above comment about not being able to export overseas and was wondering what requirements would have to be fulfilled to get your product to Australia and also if you have already tried what roadblocks did you encounter? Thank you for your interest in Sombai. You are not the first person to ask for it. Actually we would love to send our product to Australia, but the post office here does not accept to send liquids and DHL doesn’t want to send any alcohol. The only alternative for us is to find an importer/distributer so we can ship in bulk quantity by sea. If ever you are interested or know someone interested, we would be very happy to discuss. Hi, This is Kohei Miura from Japan. I have fallen in love in Sombai 2years ago. And I came back to Cambodia to drink Sombai just 3days ago. Then I tried it again. I love it at all!!!! I would like to sell it for Japanese. Are you interested in selling your Sombai in Japan? Btw Im going to go to the factory today. If you were there, I d like to talk to you about this! Thank you. It will be a pleasure to meet you at our workshop by 4pm today. By the way, you will also have the opportunity to taste our new flavours, including one special for Japanese people which is called “Umami”.